Списание "Текстил и Облекло" | Вижте темите от новия брой на списание "Текстил и облекло"
Вижте темите от новия брой на списание "Текстил и облекло"
The purpose of this paper is to apply theory of generalized nets for developing a conceptual model for control of textile production processes. The following approaches are proposed: assessment of the technological and ecological characteristics of the processes; detection of wrong/false steps of cloths production and estimation of time stabilization of the processes, applying algorithms for their control. The main textile production processes include: processing of raw materials and garmenting/finishing from fibre to ready-made product; evaluation of machine and labour productivity; evaluation of ecological or social characteristics of processes and products; technologies and quality control of the produced goods. 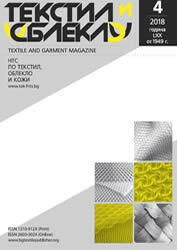 This paper offers a proposition of a conceptual model, based on the theory of generalized nets for control of textile production processes in simulative and real conditions for production of different textile goods based on its quality and ecological characteristics, leading to productivity increase. Concrete solutions have been found for describing the assessments of the different productions, which contribute to avoiding the problems of the separate steps- "begin of pipe" principle. This is leading to increasing the competitiveness of goods and enterprises and savings of resources. 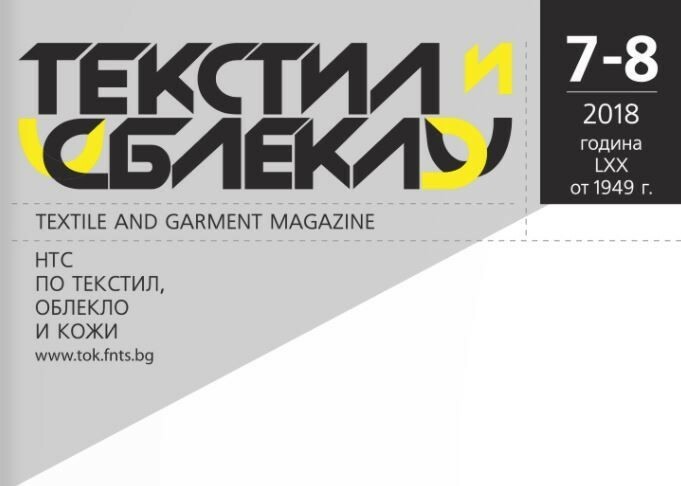 The developed conceptual model for modelling and control of textile production processes offers to the Bulgarian specialists a tool for estimation of the production and ecological characteristics of textile goods. It suggests targeted interventions in simulated or real conditions before investment decisions, innovations and equipment upgrade according to customers’ requirements or the strategy of the textile company. Through fiber processing and nanotechnology advances today, synthetic materials, which have new features and properties, can now be produced. Some are designed to protect the body, others have built-in interactive elements in themselves. These are smart textiles that respond or are automatically activated by external stimuli within them. For the sake of clarity and according to their basic functions, the materials are divided into three types: materials having protective properties; materials having properties for good human existence; smart materials - fashion, intelligent and interactive textiles. The report examines only the first two types of material, because the theme for smart textiles is quite extensive and can be considered separately. The first part of the report presents the materials with protective properties including the Nomex brands; Enka Sun and Trevira FR fibers; Dyenema - Cordura and Kevlar ballistic resistance fibers and the newer Twaron steam-aramid fibers. This part also includes fibers treated for resistance under different climatic conditions. These are the developed membrane systems, Schoeller comfort temp microcapsulas; Hollow fiber, Therma float foam and Elionex inflatable yarn; Morfotex reflective yarn; phosphorescent pigments and Tactex's touch-sensitive optic fibers. The second part of the report draws attention to materials that have properties related to human health. These are tissues using bio-functional fibers. Presented here are the textile PTFE fabrics and fragrant seals, Chitopoli antibacterial fabrics, silver metallic yarns combined with alginate fibers, as well as the Microban and Bio Guard tissues. Amicor fibers and Permafresh products, mucus-preventing tissues, the so called 'fungicides" - Accordis, Airflow and Pertex tissues are also of interest. In the text, attention is also drawn to Cupron's antibacterial technology, as well as to the tissues that absorb and control moisture such as SAF and Dacron by Cool Max, as well as to the newer generations of this type of TransportDry Fiber. The report looks at the successful collaboration between high technology and fashion. An overview of futuristic sounding fashion items is made that is unique in its design, function, purpose and use in order to present leading trends, predictions and perspectives to contemporary fashion. Combining and blending nanotechnology with the latest creations of fashion design has led to the creation of innovative and provocative prototypes. An attempt has been made to present fashionable works of smart materials of interdisciplinary nature. Attention is also paid to the dynamics of communication - another important aspect of high-tech fashion design, facilitating communication through social networks. Special emphasis is placed on pop-ups as a postmodern innovative business strategy through which fashion brands reach their customers more quickly and efficiently.